Continuing along with the series, I decided to knock out Kioptrix Level 1.3 (#4). As usual, (though hopefully soon I'll start showing off some of my enumeration scripts on here as well) I ran netdiscover to find the new VM. 172.16.119.135  00:0c:29:a8:e4:2e    01    060   VMware, Inc.
172.16.119.254  00:50:56:e1:d6:c7    01    060   VMWare, Inc.
IP in hand, I ran a quick Nmap scan to find some attack surfaces. I decided to check out the home page first, as that is usually a good starting point. Dirbuster seemed to bring up few directories of note, but two of them were called "john" and "robert", so I decided to try them as a point of possible SQL Injection. This attempt seemed to work and brought me to a Member's Control Panel displaying John's username, password, and a Logout button. Using the same input for Robert brought up similar information as well. I decided to try John's credentials over SSH hoping he 'reused' them, which of course he did. Unfortunately, he appeared to be in some sort of restricted shell that only allowed a few commands. Limited Shell (lshell) limited help. Using Robert's credentials worked as well, but he had the same limited shell. drwxr-xr-x 5 root   root   4096 2012-02-04 18:05 ..
After a bit more testing of commands and research, this appeared to be a slightly modified version of the python Limited Shell (Lshell) that was easily bypassed. Though it wasn't within the spirit of the challenge, I could have gotten the flag already as it was world readable. drwxr-xr-x  4 root       root       4096 2012-02-06 18:46 .
drwxr-xr-x 21 root       root       4096 2012-02-06 18:41 ..
With a little bit of enumeration and searching, it seemed that this kernel was vulnerable to the same ring0 exploit as Kioptrix Level 1.1 (#2). I compiled the exploit on my attacker box (32-bit system flag), and served it up over Python's SimpleHTTPServer. I switched back over to the vulnerable machine, grabbed the exploit, executed it, and got root. Root in hand, I checked .bash_history for anything interesting, and dumped the flag file. 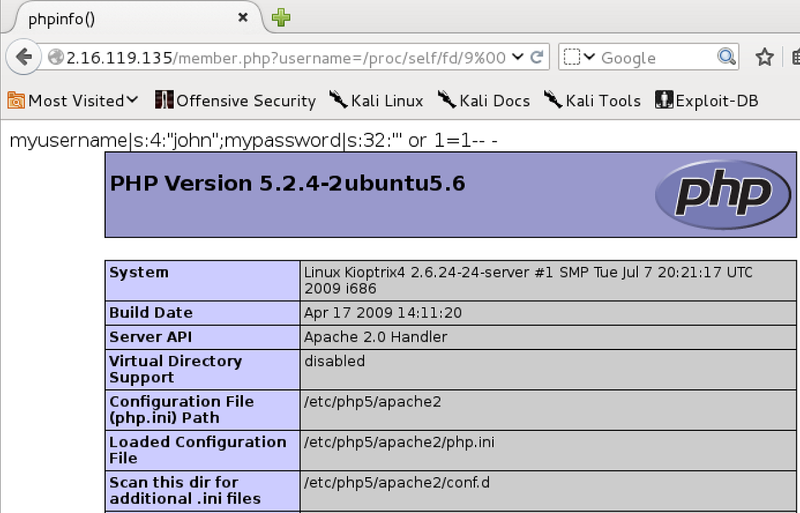 Alternatively, logging in as the John user also allowed us find some SQL credentials in the checklogin.php file. Using these credentials, we were able to login to the local MySQL instance as root (without a password, naughty naughty) and obtain some information from the database (including the same passwords found from the earlier SQL injection). With the MySQL access, I checked to see if it would be possible to escalate privileges with some User Defined Functions (UDF). 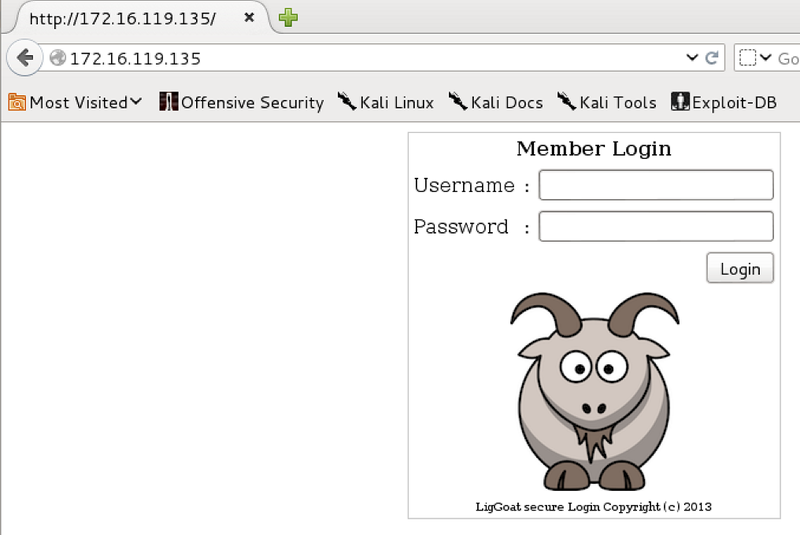 While GCC wasn't installed on the target system, I was able to create a simple setuid application on my attack box, compile it for 32bit, host it using Python's SimpleHTTPServer, wget it on the target box, have it setuid 0 by the UDF, execute it, and get root! drwxrwxrwt  3 root root 4096 2015-05-15 10:28 . But before I post the shadow file, I'll go over the third point of entry that I found as well. After a quick look, it appeared that the member.php file might be vulnerable to Local File Inclusion. That said, once I doubled up the /etc and then added a null byte, then I was able to view the /etc/passwd file. Unfortunately, I was unable to access the Apache access.log, error.log, or even environ. After a bit of manual brute forcing and research on LFI exploitation, I was able to access fd 9, which appeared in include the information I entered into the login page. I decided to test this vector with a phpinfo page injected into my SQL injection. Logging back in and returning to the fd page displayed the phpinfo, so I knew I was able to execute PHP code. With this information in hand, I decided to inject my favorite PHP shell, and test it out. Note that the vertical line between the dashes (before the PHP code) is my cursor, not a pipe character! Thanks for a keen-eyed reader for pointing that out, and I apologize for any confusion. Using the system calls I located and ran netcat to grab a reverse shell on my attacker box. On my attacker box I ran my listener, and used the same ring0 exploit as earlier just to verify that root could be obtained this way as well. An interesting thing to note was that there were some IPtables setup to prevent commonly used ports for listeners etc., which caused me some slight issues initially. And, of course, there was the shadow file to dump still. Another great VM by loneferret, and there is only one more left in the series for me. Impressive. That took some serious enumeration-fu to get the LFI and the Ring0 exploit in addition to the MySQL route that everyone else used. I’ll admit, I didn’t get past a limited shell (found John and Robert’s passwords, but no lshell escape via echo), but I found that you can also get a shell via SQL injection on the authentication screen. That brings you into the www-data account via SQLmap’s –os-shell (I also noticed that congrats.txt was world-readable at this point, which didn’t help much), from which I uploaded a python reverse shell so that I didn’t have to deal with os-shell’s prompts. Unfortunately, that basically killed my exploitation effort because I fell into the trap of believing that was the way you were supposed to attack the machine instead of going to the restricted shells. `Twas fun while it lasted, though. This made me realize I need to practice my Linux privilege escalation some before I start the OSCP in about a week as that seems to be a rather sore spot so far. Thanks, and there were definitely some cool exploits in this one. The LFI was definitely my favorite though. Ah, that’s unfortunate, but go back and give it a try now that you’ve seen a few options! Oh awesome, I didn’t even attempt to do that. I’ve always had trouble with os-shell, but it is great that it worked here. Hey, if a vulnerable machine has a vulnerability, then you’re probably meant to attack it. That said, I’m sure that he world readable flag file was a mistake. Nicely done on the LFI vector! I’m confident that was not intentional. Once you know LFI is possible, I wonder if you know a tool that can check for valid paths. I tried with LFISuite, but it doesnt detect the path you found as vulnerable. I also tried with dotdotpwn but it requires you to look for a specific string, when in reality what we are looking for is any response except for the error message we get when the file doesnt exist. In the end, I found it was possible to automate your effort a little more, by using ZAP (or Burp), fuzzing with a large LFI paths file (in my case, I used LFISuites “pathtotest_huge.txt”) and then sorting by response size. Also I know its been a minute since you worked on this, but do you remember if you tried a bash reverse shell? I’m getting all manner of error when trying it while SSH’d (let alone from the webshell, which doesnt show any errors/output). The reason i ask is because you wont always have netcat, and usually a bash reverse shell does the trick but in this case, no dice for me. Yea, I wasn’t quite sure if it was intentional or not, but it was a fun one. I actually don’t use any tools currently, but that’s something to look into! I’ve used Burp Intruder before, but that’s about it. I’ll post a blog soon if I find (or write) anything interesting for LFI though. Definitely went through it manually in this case though. I actually didn’t try a bash reverse shell, but what sort of errors are you trying to get? I agree that you don’t always have netcat though, so more than one option is always great.